The Peninsula Open Space Trust (POST) is a regional land trust dedicated to protecting and managing important coastal open space and working farmlands along the San Mateo and Santa Cruz county coastline. The Trust manages approximately 20,000 acres of open space inspread throughout Santa Clara, San Mateo and Santa Cruz counties. A single POST property contains the largest population of an extremely rare but aggressive invasive plant - Hypericum canariense (Canary Island Saint John's wort). This long lived invasive shrub native to the Canary Islands and Madeira; has escaped from cultivation and has established fewer than a dozen coastal populations within California. Many regional biologists have identified this species as an exceptional target for eradication. 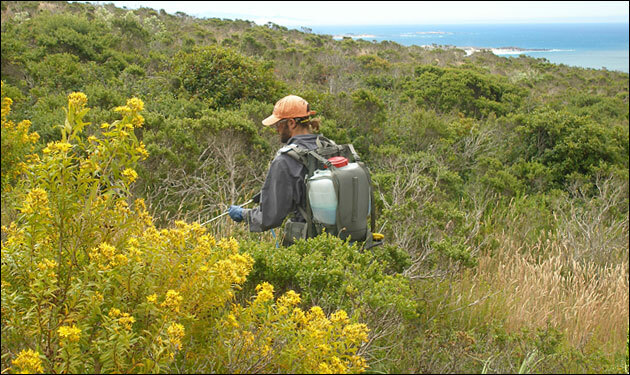 A single species eradication event is the Holy Grail of invasive species management. Often attempted but rarely successful, most programs have too many complex variables and high costs to ever reach complete eradication. Shelterbelt was hired to experiment with potential control techniques, investigate unknown variables of the plants basic biology, and ultimately develop an eradication plan, white paper, control calendar, and cost estimate for a regional eradication effort. The plan was prepared as a template for a statewide eradication effort with a high probability of success.